Andrew Lenehan was born in Sligo, Ireland, in 1815, son of Michael and Mary Lenehan. On 2 October 1840 in Sydney, he married Susan Mary (d.1881), daughter of Andrew and Ann Templeton, and had four sons and three daughters. He died at St Leonards on21 February 1886, aged 73, and was buried at St Charles Churchyard, Ryde. Andrew Lenehan arrived in Sydney on 31 August 1835 on the Jane Goudie. He used local and imported timber to make prized furniture and by 1844 had set himself up as an upholsterer, cabinetmaker, appraiser and undertaker at 271 Castlereagh Street. His decorations for the Olympic Theatre in 1842 were highly praised. His eldest son, Henry Alfred Lenehan (1843–1908), became the government astronomer at the Sydney Observatory. 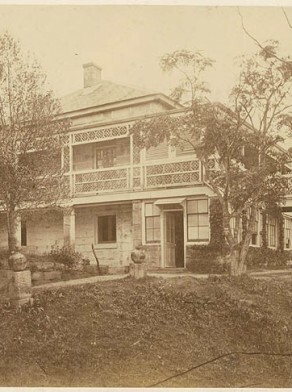 In 1858, Andrew Lenehan was living at Ranelagh House, Darling Point but in 1867 moved to Potsdam (built by the Joubert brothers and later called Windermere), at 25 Ernest Street, Hunter’s Hill. Lenehan was a Fellow of St John’s College, at the University of Sydney. Andrew Lenehan was elected Councillor, 4 November 1850 to 8 December 1852. Harley Wood, ‘Lenehan, Henry Alfred (1843–1908)’, Australian Dictionary of Biography, National Centre of Biography, Australian National University, http://adb.anu.edu.au/biography/lenehan-henry-alfred-7170/text12389, accessed 3 January 2013.